Good morning! Today I'm playing along in the JUGS9 challenge, which is to use a template to create a holiday gift package. I used one of the Papertrey Timeless Templates created by Lauren. This one is called Get a Handle on It. I think one of the nicest gifts you can give someone is not necessarily for a birthday or special occasion, but a "Just Because" gift and that's exactly what I made today (sorry, yes I realize the challenge was to make a holiday gift package ~ at least the contents is a holiday gift!). The box is 3.5" x 3.5" x 3.5". It is the perfect size for many fun items. When I was at Starbucks the other day, I saw that they had the cutest mini coffee cup ornaments. It looks exactly like the cup you get your hot coffee to go in! I knew that I just had to get this for April, one of Sabrina's wonderful para aides at school. I rarely see her without coffee in hand! She is just wonderful with Sabrina, too ~ she gets her to eat practically anything and everything! Sometimes Sabrina can be a handful, but if anyone can get her to listen, April can... and Sabrina absolutely adores her!! I started with a Kraft base and for my image panel, I embossed "Thanks a Latte" with black embossing powder and stamped the cup partially over it. I added some yummy thick ribbon to complete the packaging. Accessories: Labels Nestabilities (Spellbinders), Get a Handle on It template (Papertrey Ink), Damask embossing folder (Provo Craft), Word window punch (SU! ), Corner rounder (Zutter), Cropadile, Long reach punch, Craft knife, Black embossing powder, Pearls (Kaisercraft), Ribbon, Red line tape, Foam tape. just gorgeous!! Love The fab ribbon! This is just darling! I may have to give out some of these. Stephanie, this is such a sweet gift! 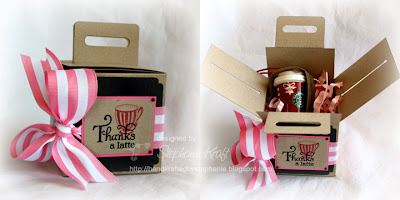 I love how the big candy cane striped bow coordinates with the cup of latte! Thank you for playing along with Just Us Girls template challenge! I hope you join us Saturday for a fun sketch challenge! Fabulous Stephanie - truly adorable and that ribbon is YUMMY - great job with Lauren's template! Thank you for playing along with Just Us GIrls again.